175 Commercial Real Estate and Properties in Darwin are listed in 7 categories. We have 115 Industrial Warehouses for Sale , 40 Offices for Sale , 27 Development Lands for Sale , 7 Retail Shops for Sale , 7 Medical and Consulting Properties for Sale and 4 Showrooms for Sale . Warehouse with mezzanine offices Warehouse total building area 172 m2 Warehouse storage area 133 m2 Mezzanine area 39 m2 divided as 2 rooms and air conditioned Tilt slab concrete construction Wide motorised roller door Shower, W.C, kitchenette Small rear yard security fenced 2x car parks Available now View by Appointment 7 Days! For Sale: $340,000.00 ex GST For more information, or to arrange an inspection, call Nick Syrimi today at Ray White Commercial (NT) Visit our website rwcnt.com.au to view all our property listings! Strata office unit approx. 81 m2 Open plan fit out ready to occupy Floor coverings carpet tiles 2 ceiling cassette air conditioners 2 car parks on tile Lift provided to building Designated customer parking throughout the complex Commercial Complex with a mix of showroom, office and warehouse units. View by Appointment 7 Days! For Sale: $225,100 + GST For more information, or to arrange an inspection, call Nick Syrimi today at Ray White Commercial (NT) Visit our website rwcnt.com.au to view all our property listings! New strata office unit First floor tenancy Building area approx. 98 m2 Open plan fit out ready to occupy 2 ceiling cassette air conditioners Floor coverings carpet tiles Amenities kitchenette, plus W.C. Glazing front and rear 2 car parks on title Lift provided to building Designated customer parking throughout the complex View by Appointment 7 Days! For Sale: $269,500.00 + GST For more information, or to arrange an inspection, call Nick Syrimi today at Ray White Commercial (NT) Visit our website rwcnt.com.au to view all our property listings! 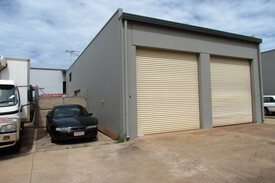 Duplex industrial complex Warehouse 1 Street front position Total building area approx. 300 m2 Office area approx. 60 m2 Warehouse / factory area approx. 240 m2 Motorised roller doors Kitchenette Shower / toilet combined Front yard area Qty 5 car parks Currently vacant Warehouse 2 Rear unit in the complex Total building area approx. 405 m2 Office area approx. 14 m2 Warehouse / factory area approx. 346 m2 Motorised roller doors Kitchenette, shower /toilet combined Live in facility 2 bedroom flat on the mezzanine level Rear yard area approx. 100 m2 Qty 5 car parks Currently leased 2+2 years View by Appointment 7 Days! For Sale: $980,000.00 + GST For more information, or to arrange an inspection, call Nick Syrimi today at Ray White Commercial (NT) Visit our website rwcnt.com.au to view all our property listings! Conveniently Located Strata Warehouse With Office $310,000 (GST not applica..
Strata warehouse unit with office Building area approx. 166 m2 1x Office approx. 12 m2 area 1x staff room with kitchenette approx. 12 m2 area Masonry block construction 1x motorised heavy duty roller door 3 phase power Parking area directly in front of the premises 15 metres wide Unit entitlement area 248 m2 Convenient industrial location less than 10 minutes from the city View by Appointment 7 Days! For Sale: $310,000.00 (GST not applicable) Also available for lease @ $1,750 (GST not applicable) For more information, or to arrange an inspection, call Nick Syrimi today at Ray White Commercial (NT) Visit our website rwcnt.com.au to view all our property listings! Office unit building area approx. 90 m2 Open plan fit out Ready to occupy Qty 2 under cover car parks on title Unit entitlement area 117 m2 Fully air conditioned Bathroom toilet + shower combined Kitchenette Floor coverings carpet Vacant possession on settlement Located in a modern complex on the corner of Hickman Street and Reichardt Road with over 30 customer car parks scattered around the complex. Secure your future Invest in Commercial property! View by Appointment 7 Days! For Sale: $260,000 + GST For more information, or to arrange an inspection, call Nick Syrimi today at Ray White Commercial (NT) Visit our website rwcnt.com.au to view all our property listings! Strata warehouse unit of masonry block construction Warehouse area approx. 110 m2 Secure private rear yard 20 m2 1 car park on title Unit entitlement 144 m2 Recently new internal upgrade includes air conditioned office/workroom area of approx. 55 m2 which is divided as two rooms, storage above has drop down ladder access Stainless steel wrap around benches with double sink Bathroom with toilet and shower 3 meter wide motorised roller door at the front 3 meter wide manual operation roller door at the rear Vacant possession Located in the rear corner of a commercial complex Minutes to the CBD, Wharf or Fisherman's Duck Pond View by Appointment 7 Days! For Sale: $300,000 + GST For more information, or to arrange an inspection, call Nick Syrimi today at Ray White Commercial (NT) Visit our website rwcnt.com.au to view all our property listings! New strata office unit First floor tenancy Building area approx. 100 m2 Open plan fit out ready to occupy 2 ceiling cassette air conditioners Floor coverings carpet tiles Amenities kitchenette, plus W.C. 2 car parks on title Lift provided to building Designated customer parking throughout the complex View by Appointment 7 Days! For Sale: $275,000.00 + GST For more information, or to arrange an inspection, call Nick Syrimi today at Ray White Commercial (NT) Visit our website rwcnt.com.au to view all our property listings! New strata office unit First floor tenancy Building area approx. 98 m2 Open plan fit out ready to occupy 2 ceiling cassette air conditioners Floor coverings carpet tiles Amenities kitchenette, plus W.C. 2 car parks on title Lift provided to building Designated customer parking throughout the complex View by Appointment 7 Days! For Sale: $269,500.00 + GST For more information, or to arrange an inspection, call Nick Syrimi today at Ray White Commercial (NT) Visit our website rwcnt.com.au to view all our property listings! Total building area approx. 493 m2 Construction: Portal steel frame with metal cladding Street exposure to Verrinder Road Industrial complex of 8 strata units Office area approx. 146 m2 Factory area approx. 347 m2 Mezzanine storage approx. 50 m2 Concreted driveway and parking area Parking directly in front of the premises Office area fully fitted out with: Reception area plus 3 partitioned offices Boardroom with kitchenette 2x bathrooms Warehouse area clear span 1x wide motorised roller door 1x roller door at the rear View to appreciate the quality of the premises on offer Excellent condition throughout View by Appointment 7 Days! For Sale: $940,000.00 + GST For more information, or to arrange an inspection, call Nick Syrimi today at Ray White Commercial (NT) Visit our website rwcnt.com.au to view all our property listings! Motivated vendor all offers considered Freestanding facility Total building area 722 m2 Warehouse area 613 m2 Office and amenities area 109 m2 Rear hardstand area approx. 700 m2 Dual driveways for drive around access Office area is of masonry block construction Fitted out internally with a large office, reception area, lunch room with kitchenette, and store room Disabled bathroom + shower, plus another toilet + separate shower Warehouse construction steel frame with metal cladding Clear span internal warehouse space Internal clearances 7.3 metres up to 9.1 metres Wide sliding doors front and rear, offering drive through truck access Security fenced around the perimeter, bitumen sealed driveways and hardstand Easy access to Port, road and rail freight facilities Land area under title 1920 m2 Planning Scheme Zone DV (Development) Offered vacant possession on settlement View by Appointment 7 Days! For Sale: $850,000.00 + GST For more information, or to arrange an inspection, call Nick Syrimi today at Ray White Commercial (NT) Visit our website rwcnt.com.au to view all our property listings! Double storey office showroom plus warehouse Ground floor showroom, office and amenities area approx. 176 m2 First floor office amenities area approx. 140 m2 Warehouse/factory area approx. 724 m2 Awning area at rear approx. 107 m2 Total building area approx. 1,147 m2 Clear span factory area Qty 3 sliding doors approx. 4.22 metres wide Hardstand area concreted area approx. 405 m2 Street parking area directly in front of the property Zoned LI (Light Industry) Land area 1530 m2 Vacant possession on settlement View by Appointment 7 Days! For Sale: $1,560,000.00 + GST For more information, or to arrange an inspection, call Nick Syrimi today at Ray White Commercial (NT) Visit our website rwcnt.com.au to view all our property listings! Opportunity for the Developer/Astute investor. Partially constructed warehouse development. Stage 1 Qty 4 warehouse units approx. 140 m2 each in area Concrete slab complete with plumbing drainage Concrete tilt panels are manufactured and ready to install Stage 2 Qty 2 warehouse units approx. 244 m2 each in area Building and engineering plans approved for construction Total Land area 2,220 m2 Zoning LI (Light Industry) There is the ability to combine four units as one building 560 m2 in area and allow the balance of the land as hardstand View by Appointment 7 Days! For Sale: $650,000 + GST For more information, or to arrange an inspection, call Nick Syrimi today at Ray White Commercial (NT) Visit our website rwcnt.com.au to view all our property listings! Warehouse 1,282 m2, plus office building 201 m2, land parcel 4,390 m2 Corner road frontage to both Verrinder and Tivendale roads LEASED: 5 + 5 years lease term 8% Nett return Warehouse overall building area 1282 m2 Includes: Office, lunch room with kitchenette, bathroom and store combined area approx. 100 m2 Mezzanine storage area approx. 100 m2 Bathroom includes 2 x W.C shower Construction portal steel frame with metal cladding, bare concrete floor Clear span approx. 20 metres wide x 60.45 metres long Qty 9 wide roller doors all motorised Wash bay area external to the warehouse area approx. 10 metres x 15 metres The hardstand area is concrete sealed The property is security fenced around the perimeter The separate office building is of masonry block construction Building area approx. 201 m2 Including verandah and car port area Internal fit out includes Showroom and reception area, plus store room 4 x partitioned offices Bathroom and kitchen Land parcel area 4390 m2 Zoning GI (General Industry) View by Appointment 7 Days! For Sale: $2,400,000.00 Excluding GST For more information, or to arrange an inspection, call Nick Syrimi today at Ray White Commercial (NT) Visit our website rwcnt.com.au to view all our property listings! NEW RELEASE Ground floor fully air conditioned showrooms, wide walkways and excellent vehicle access and parking. Showroom Unit 32/5 McCourt Road Building area 129 m2 Masonry construction Shop front glazing Architectural design Peddle Thorp Architects Building complete and ready to occupy For Sale: $361,200.00 + GST Note Showrooms (Class 6 ) also comply for offices (Class 5) Please contact Nick Syrimi on 0412 537 638 from Ray White Commercial (NT) for further information. Strata unit building area approx. 141 m2 Ground floor Glazing to shop front Open plan fit out ready to occupy Kitchenette plus 1 x W.C Ceiling mounted cassette air conditioning units Floor coverings carpet tiles 2 car parks on title Designated customer parking throughout the complex New commercial complex Available to occupy now View by Appointment 7 Days! For Sale: $394,800 + GST For more information, or to arrange an inspection, call Nick Syrimi today at Ray White Commercial (NT) Visit our website rwcnt.com.au to view all our property listings!